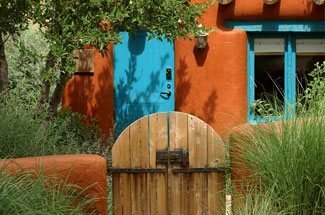 In the summer, Santa Fe is filled with life surrounded by a gorgeous desert. In the winter, the city turns into a winter wonderland! The kiva fireplaces are lit each night filling the air with a smoky aroma. Paper bags filled with votive candles line the streets. The neighboring Sangre de Cristo Mountains are dusted with snow, making it perfect for winter activities. During your winter stay at Four Kachinas, try something fun like cross-country skiing in Santa Fe! The Southwest Nordic Ski Club has slowly grown throughout the years with the mission to encourage involvement in cross country skiing in Santa Fe. They take care of the Pajarito Nordic Ski Trail and always keep an update of the current conditions on their site. The ski trails wind through a breathtaking aspen forest on top of a blanket of snow. You’ll love traveling through the gorgeous wilderness covered in white. An individual membership is just $20 for access to the trails, or you can get a family membership for $30! The Aspen Vista Trail is perfect for cross-country skiing in Santa Fe. In the summer months, this trail is a favorite hiking path filled with hikers there to see the nature, wildlife, and stunning views. The gradual uphill climb and size of the large trail make it ideal for visitors of all abilities. In the winter, it is a favorite for cross-country skiing. Skiers visit from Santa Fe and the surrounding areas to have some fun in the snow while enjoying the views from the mountain. Cottam’s Ski Shop is less than 20 minutes away from Four Kachinas making it the perfect spot to get all the gear you’ll need. They’re experts in skiing, so they’ll help outfit you with all the supplies you need to cross-country skiing in Santa Fe. They even have jacket rentals so you can pack lightly for your trip! Plus, you can pre-make reservations for everything you need so it will be ready as soon as you arrive. You’ll love a winter stay at Four Kachinas. Our bed and breakfast is just steps away from the heart of the scenic downtown area providing guests a short commute to everything Santa Fe has to offer. Explore the city while it’s decorated for the holidays, then hit the trails! 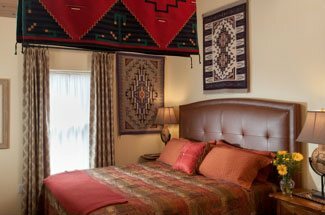 After cross-country skiing in Santa Fe, you can come back and relax in your cozy room. Get the fireplace running to warm up after a day outdoors! Book your winter stay at Four Kachinas today.